Heat oil in a stockpot over medium-high heat and add the celery root, carrots and garlic. Cook until golden, about 10 minutes. Stir in the onion, celery root tops and kale and cook for another minute. Pour in the stock and add the bay leaves and season well. Bring to a boil and reduce heat and simmer for 15 minutes, or until the vegetables have softened. Boil salted water and add in the pasta and cook according to the directions, roughly 8 minutes. Meanwhile, heat the oven to 425F degrees. Butter the baguette slices and place in the oven until golden brown, roughly 5 minutes. Discard the bay leaves and and stir in the pasta. 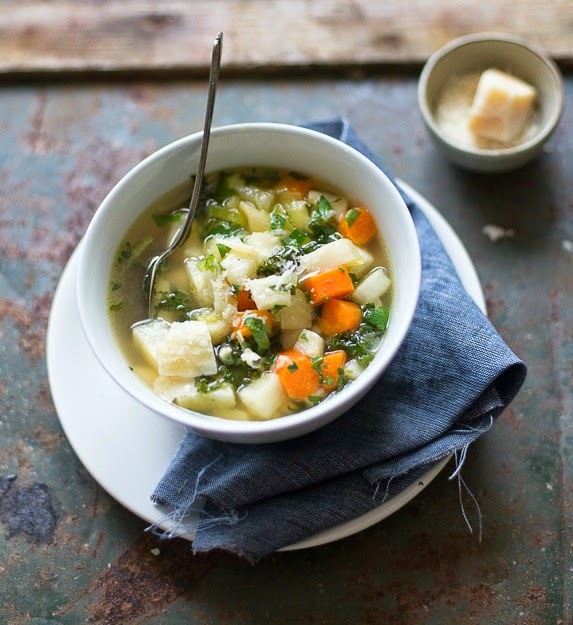 Ladle the soup into a bowl and top with a baguette slice and some grated Parmesan.